Dealing with a hardware+software platform born under linux can be a real pain for people not used to it so I will try to make things easier for them explaining what I did to make that great HackRF One hardware working under Windows. I am still not too good in those kind of subjects so I will try to explain things the same way I understood them; if you find incongruences please feel free to correct me and I will update this post giving credits to contributors. It is a platform with open hardware and software created by by Michael Ossmann specific for radio frequencies analysis; this is at the moment the only hardware able to scan the widest range of RF signas starting from 30MHz to 6GHz !! (another hardware that is going to be released this year is Airspy but its range will be from 24MHz to 1.7GHz - there are other very cheap usb dvb dongles able to do that kind of analysis but they are not natively built for that kind of stuff and are really limited compared to HackRF One). 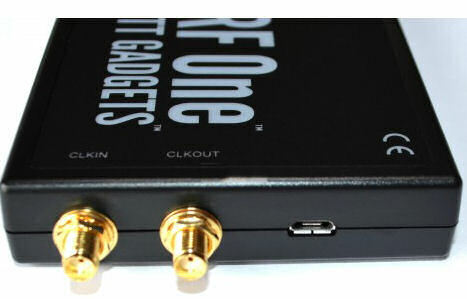 Using an hardware device called Ham-It-Up RF converter (picture below) the HackRF One can also explore the LF and MF frequencies range so the full range is extended from 300kHz to 6GHz !!! This device is the succesor of the Jawbreaker hardware and its manufacturing was possible thanks to a specific kickstarter campaign. Frequency Range: 10MHz - 6GHz (kickstarter campaign says "from 30MHz" while acutal official site says "from 10MHz") [from 300kHz to 6GHz if you add an Ham It Up RF Converter hardware] - the range practically starts from the upper part of LF (Low Frequency) band to the lower part of SHF (Super High Frequency) band. the peaks above represent radio broadcasting stations. So everything in the range of the bandwidth you are listening to is recordable -> so it can save up to 20 million samples per second ! - half-duplex transceiver: it means that it can transmit or receive but can't do both at the same time. However, full-duplex operation is possible if you use two HackRF devices. - 8-bit quadrature samples (8-bit I and 8-bit Q): I don't know what it is, if someone can explain it I will be grateful ! Usually under Windows HackRF will work with ONE USB PORT AND THIS ONE ONLY !!! 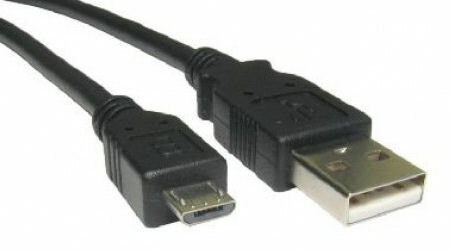 So try all USB ports before saying "hardware not found by SDRSharp!" - now set the resolution: this is the resolution of the peaks you can see in the upper part of the Spectrum Analyzer: the higher it is the more the processor will work: setting it above 65535 can cause system performance slow down. Double-click on any peak to tune to that frequency and listen to it ! The Waterfall represents a graphic "cascade" representation of the signals across the frequency range you are investigating, usually "coded" with a specific color which indicates signal amplitude or strength displayed over time (more recent are at the top of the waterfall, older ones are at the bottom). 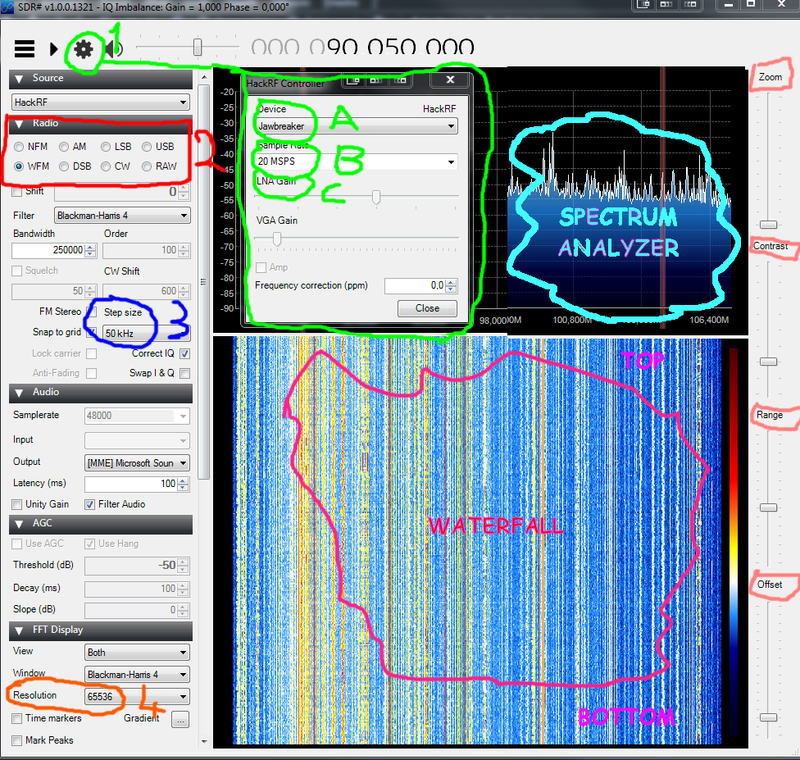 If your waterfall doesn't seems to have any broadcast signal try to increment the LNA gain in the settings. CONTRAST: it changes the color of the waterfall "silent" background and of the waterfall "hot lines" (I prefere the "silent" background to be blue and the "broadcasting frequencies" to be orange/red as you can see in the watefall picture above). Please note that most of them have many sub-ranges ! 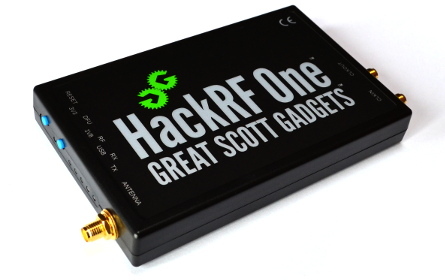 Here are some GREAT SDR with HackRF tutorials by Michael Ossmann, the author of HackRF ! Next part will be installing the HackRF environment and compiling it under Windows ! You have now compiled HackRF ! If, for some strange reason, the software will not start anymore over time try to reinstall the fist 3 packets of the environment and it should start again... weired but it did the work in my case. 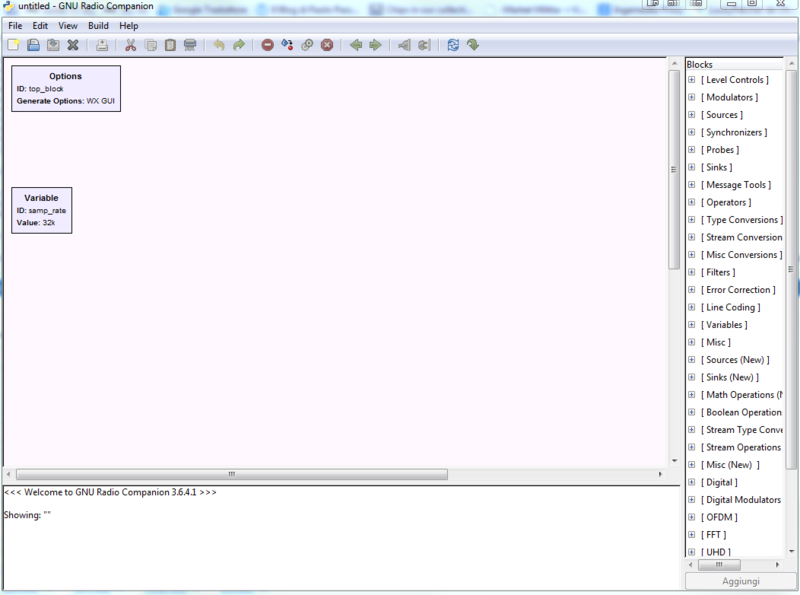 Now a tutorial on how to use gnuradio is really welcome ! on the back we got help by a sticker: 433.92MHz ! 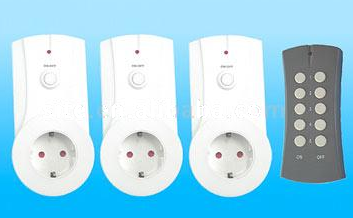 Opening it up it revelas a HS2262A-R4; some datasheets are available using google. 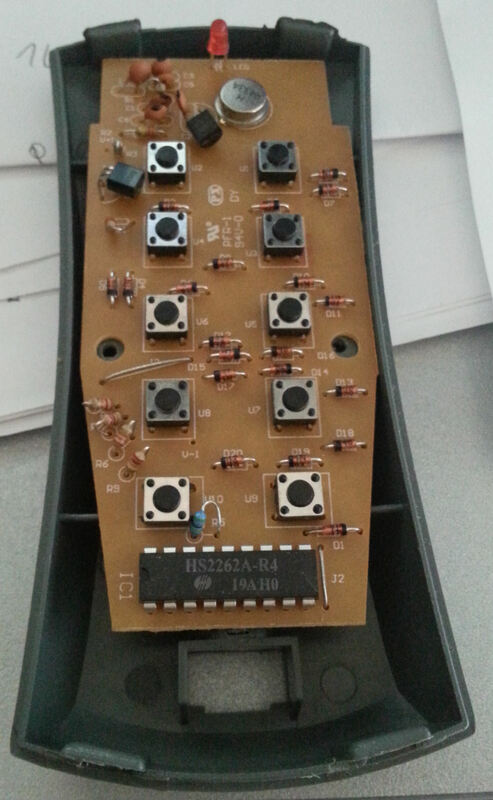 So here what was needed to reverse this remote RF control. Ok, the WOW Signal is here ! The .WAV file will be located in the same SDRSharp .exe folder (it can get really big if you let it records for lot of seconds!). - Cut/Select the interesting part of the recording and amplify it to "new Peak Amplitude = 0.0"
here you can see 3 recorded "tracks" of 3 different buttons using the spectrum view; notice the short and long pulses; I assumed short = 0 and long = 1 in an OOK modulation. 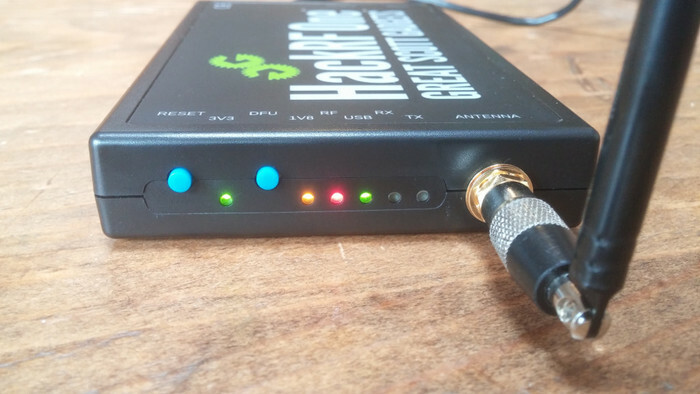 If someone is able to explain me how to replicate those signals using HackRF One I will make a guide here ! An incredibly useful site is the FCC ID Search Page. 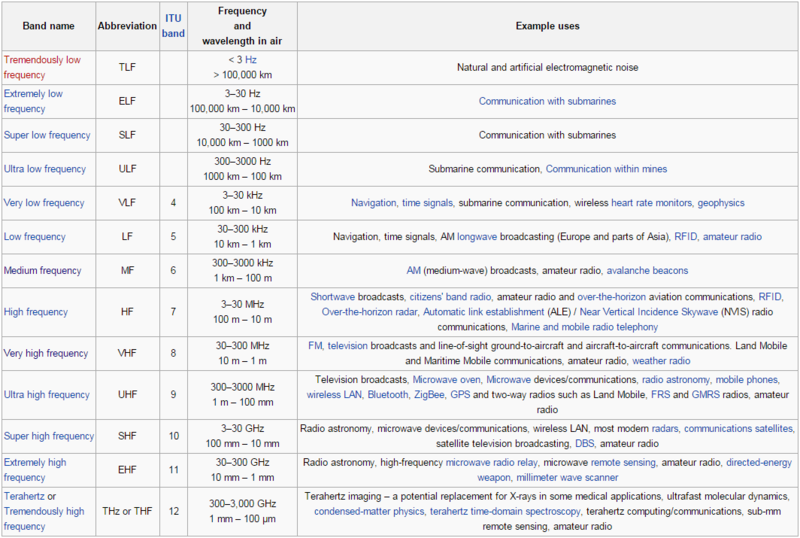 FCC information includes RF info and the occasional schematic. Yeah you are right ! Lot of free info there! EDIT: it seems not to be possible to use GNURADIO with HackRF under Windows due to a missing gr-osmosdr compiled package... I will investigate GNURADIO in the future when it will natively support HackRF. 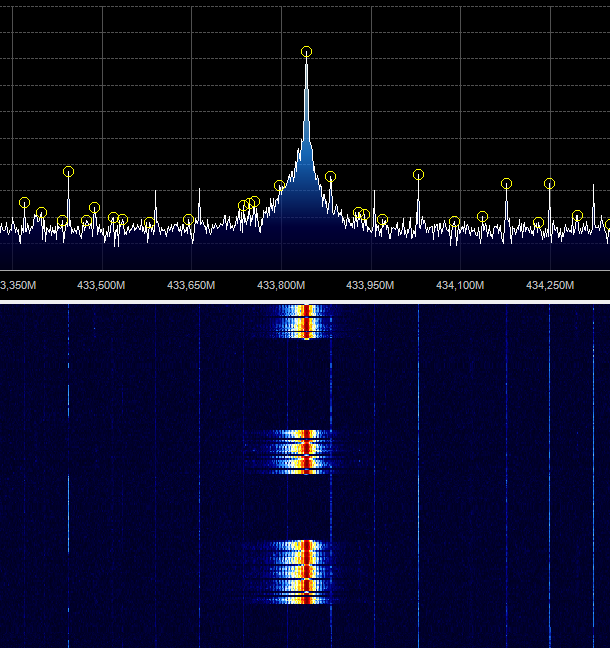 I've been diving into sdr, as a pet project I am writing gnuradio-modules to interpret DCS (digitally coded squelch) from a handheld radio (they use DCS / CTCSS to have 'private' channels, by transmitting a sub-audible signal which signals that the squelch should be opened). It's nice to extract that, because then you can jump on any such transmission with the same dcs-key and join the party (I can use my computer to tell the kids it's dinner time). Michael Ossman has been talking about that in videos 6 and 7. Particularly 7: http://greatscottgadgets.com/sdr/7/. I'm now starting to understand the benefits of using quadrature sampling, and can't help thinking about if that's something we could do in proxmark. We wouldn't have to start anew from scratch, I think, but maybe have a separate mode for quadrature sampling. It seems a lot simpler to accurately determine PSK / ASK / whatever modulation scheme using that method instead of our current implementations which are not very robust. Is there anyone else interested in exploring this? * Low-pass filter the signal. Check the waterfall graph to see how much bandwitdh is needed. * Decimate heavily, you definitely don't need 20MHz channel width. * Have the antenna *really* close to the signal source. Or, try to use an inductive antenna (coil) - e.g. a proper pm3 antenna. I used a pm3-antenna on my oscilloscope when doing the iclass-debugging. * Do a recording to a file-sink. Then do the experimentation on the recorded file using a file sink. I will do more tests with your suggestions ! I'm having a lot of trouble attempting to run the Compiling Environment part of this explanation. Can you give me jump start on this?